We are very pleased to bring you Duane Morris' first official alumni newsletter. Our goal is that Alumni Spotlight will help you to discover new connections and expand your network as a member of the extended Duane Morris family. In these pages, we catch up with former partner Chuck Whitney, who is now leading the legal team at Oglethorpe Power Corporation. It was not surprising that Oglethorpe, a Duane Morris client, would ask Chuck to help the company navigate legal issues as it expands. You will also hear from newly promoted Duane Morris partner Chris Winter, a member of the Business Reorganization and Financial Restructuring Practice Group in the firm's Wilmington office. Over the past year, we have collected news about our Duane Morris colleagues and alumni to share with you here. It is exciting to see what Duane Morris attorneys have achieved, no doubt seasoned by their experience at the firm. Finally, we remember our friend and partner David Sykes. Dave, who lost his courageous and decade-long battle with cancer, died in February at age 72. Across the country, Dave was undeniably one of the most-recognized lawyers ever to be associated with Duane Morris, almost single-handedly making Duane Morris a national presence in the area of bankruptcy law. 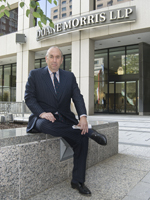 He spent his whole professional career at Duane Morris, was the firm's managing partner from 1994 to 1997 and its vice chairman from 1998 to 2004. His contributions were pivotal. Dave was also a great mentor and teacher of lawyers, including those who are judges today, such as Midge Rendell, Jim Peck, Gene Pratter, Neil Olack, Robert Grossman and Karen Overstreet. For me, Dave Sykes was a colleague and good friend for 33 years. We look forward to reuniting with you at an alumni event in the near future. If you would like to share your news and experiences in future editions of Alumni Spotlight, please contact us at alumni@duanemorris.com or reach out to me personally at soroko@duanemorris.com.